Since the first ‘V/H/S‘ was so successful and became an instant cult hit, the following year, they made ‘V/H/S 2‘, which followed the same formula and was even better than the first go around. Now in 2014, we have the third installment and possibly the final film called ‘V/H/S 3: Viral‘. This time around, there are only three segments with a wrap around storyline, and instead of the whole VHS angle, this is more about things being filmed with a mobile phone and being uploaded to the internet, hence the ‘Viral’ aspect. The wrap around story is quite cool and features a a young couple watching a live police chase happening in their neighborhood. Once they see it coming down their street, they boyfriend uses his mobile phone to record the police chase in hopes that it goes viral online. That brings us to our first segment called ‘Dante The Great‘, directed by Gregg Bishop (Dance of the Dead), which tells the story of a famous magician and the mysterious murders and disappearances of his female assistants. 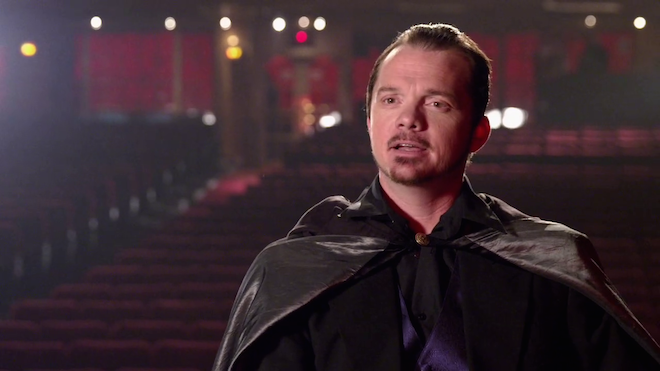 Dante (Justin Welborn) comes across a cloak, which is said to belong to the great Harry Houdini. Once he has the cloak, he is able to pull off any illusion with great ease, but there is something sinister about the cloak that might be the key to all these murders. This segment had both the found footage aspect as well as a straight narrative, but the special effects were pretty amazing, and Welborn did a great job as a sadistic and mad magician. The second segment was by far my favorite and was directed by the legendary Nacho Vigalondo (Time Crimes). His segment is called ‘Parallel Monsters‘ and was the right amount of fucked up and scary that he can make a feature length movie out of this. 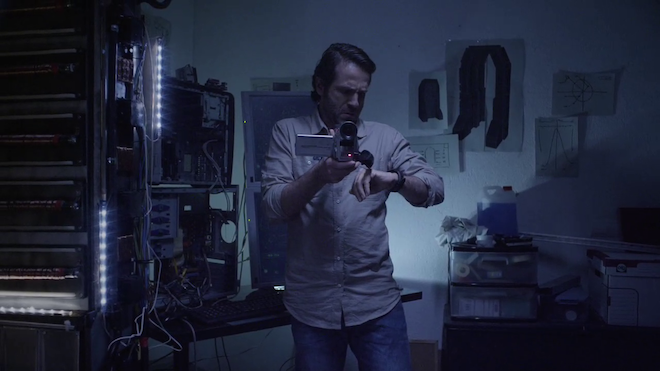 This short starts off with an inventor who builds a machine in his basement that connects him to a parallel universe. Once this is open, he sees the mirror image of himself and his house. The two dopplegangers are friendly and are equally excited about this invention. They both decide to take 15 minutes to cross over into each other’s universe and explore the similarities and differences. But once they do, we see that there are more things that are different than the same as we see bags dripping with blood and guts hanging around the house, blood orgies, sirens, and a satanic cult presence everywhere. And just when you think you’ve seen it all, Nacho adds a level of horror and shock that would make the Japanese horror film genre beg for mercy. It’s quite amazing. And the last segment is called ‘Bonestorm‘ and is directed by Justin Benson and Aaron Moorhead(Spring). This piece is all sorts of fun and the premise is very simple. We meet a few jerk-off skateboarders who are trying to make their ‘sponsor’ video by pulling obnoxious pranks and skateboarding on city property. The four skateboarders head to Tijuana, Mexico to film their last scene in their video when a satanic and supernatural demon cult shows up and starts attacking them. Then this film turns into a video game like simulation as the skateboarders in first person mode use their skateboards, ninja swords, and anything else they can get their hands on to kill these demons from hell. It will keep you on the edge of your seat throughout the entire battle. I really hope that this isn’t the last film in the ‘V/H/S‘ series. That being said, this third installment still has some fantastic moments that are guaranteed to thrill and chill you. 'V/H/S: Viral' comes with a good 1080p HD transfer presented in 1.78:1 aspect ratio. Like the other two 'V/H/S' films, the video varies. These were all supposedly filmed on a variety of cameras, ranging from security cams, GoPros', old VHS cameras, and newer digital cameras. So the image fluctuates from somewhat sharp to very murky, fuzzy and down right bad. But that's never the fault of the transfer, but rather this is how the movie is supposed to look or how the filmmakers edited the film to appear with its warts and all. The detail is not necessarily ever really sharp or vivid with the exception of a few shots that reveal some fine detail. Other than those particular scenes, the picture is soft and rather flat. But again, this is on purpose. Colors do look quite good in certain segments and pop off screen. They are well saturated and balanced as well. Skin tones are natural and the black levels are usually deep and inky, but sometimes they can cause crush. There are a ton of video issues here, but this is all part of the 'V/H/S' plan. All of the banding, video noise, dirt, debris, and scratches are part of the plan. While it might not have the best looking video presentation, it does what it set out to do, and you can't knock it for that, leaving this picture with good marks. This release comes with a good lossless DTS-HD 5.1 audio mix. Like the video above, the audio has its issues, but it's all part of the bigger plan of this 'V/H/S' series. There are pops, cracks, high shrieking shrills, rocky sound effects, and muffled voices, but that's the way it's supposed to sound. It has to have that realism as it were actually filmed with hand held video cameras of the consumer grade. And it does that job very well. Most of the sound effects are very good in certain segments and pack a punch, while others don't. Dialogue isn't always crystal clear and sometimes it's difficult to hear what the characters are saying, due to the environmental elements surrounding the image or the camera cutting in and out. That being said, the LFE is great and the dynamic range is quite wide, leaving this purposely flawed audio presentation with good marks. Audio Commentary - A fun and lively commentary track, recorded at Fantastic Fest in Austin with directors Marvel Sarmento, Aaron Moorhead, Justin Benson, Nacho Vigalondo, Gregg Bishop, and actor Shane Bradey. All directors discuss each other's works and what went in to their own shorts throughout the entire track. It's lively, entertaining, and quite fun. There is a Q&A feel here, which was nice as there is somewhat of a format rather than a bunch of colleagues laughing and making up nonsense. This is worth a listen. Todd Lincoln’s ‘Gorgeous Vortex’ (HD, 17 Mins.) - This extra isn’t found anywhere on the menus, but is rather added at the end of the final credits for the movie. There is no dialogue to the film, but follows a woman in a dreamlike or nightmare type of state as she battles a hideous monster, is raped by masked men, all while dressed in next to nothing. The film is beautiful and not an action piece at all, no matter how it might sound. It’s a head scratcher for sure, but worth watching. 'Bonestorm' (HD, 6 Mins.) - This is fun behind the scenes of this particular short film that looks at the visual and makeup effects, on set footage, editing, fight choreography, and interviews. Also included are some storyboards and production stills. 'Dante the Great' (HD, 9 Mins.) - Here is a decent look at the behind the scenes of this particular short, complete with cast and crew interviews, on set footage, and separate photo galleries. Worth the look. Interviews (HD, 16 Mins.) - The cast and crew from each segment talk in depth about each of their horror shorts. They discuss how they came up with the stories, characters, and makeup effects. They also discuss the gore and how much fun or difficult the shoot was. AXS TV: A Look at 'V/H/S: Viral' (HD, 2 Mins.) - A very short look at the film with all too brief cast and crew interviews from each segment. Too short to give any real information. Trailers (HD, 2 Mins.) - Other trailers for Magnolia. 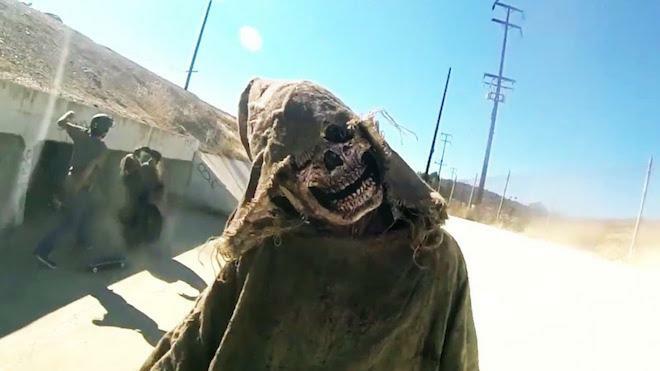 'V/H/S: Viral' is my least favorite in the series, despite a couple of very good segments. I just think it lacks the genuine scares and thrills of the last two. That's not to say this one is without its merits, but it's just my least favorite of the three. And if this is the last one, instead of going out with a big bang, it went out with a whimper. 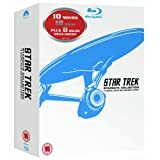 The video and audio presentations are both true to the source and gimmick that this franchise has and the extras are all worth watching. If you're a fan of this particular series of films, you'll want this in your collection.